This Car is in Excellent Condition, with Electric Sliding Roof, Full Leather, Heated Seats, Audible and Visual Front & Rear Parking Sensors, 18" Alloys, Cruise Control, Tinted Windows, Climate Control, Air Conditioning, Electric Windows with One Touch, Electric Mirrors, Radio/CD Player., 2 KEYS, MOT TILL OCTOBER 2019, HPI CLEAR, 4 MERCEDES BENZ SERVICES + 1 BY INDEPENDENT GARAGE, LAST SERVICE in jANUARY 2019. FINANCE CAN BE ARRANGED THROUGH RECOMMENDED FINANCE COMPANIES +++ ALL CREDIT CARDS ACCEPTED +++ PART EXCHANGES WELCOME +++ DRIVE AWAY TODAY WITH OUR COMPLIMENTARY 5 DAY INSURANCE PLAN. VIEWING STRICTLY BY APPOINTMENT ONLY. PLEASE CALL US ON 0203 797 1113 (during working hours, Monday-Friday) or 07970 743 554 anytime up to 8pm every day, PRIOR TO VISITING to make sure we have the vehicle ready for your inspection at our office. Please call us for more information about this vehicle or to make an appointment to view it at our premises in Harrow, Middlesex. For directions, please go to www.firstnationalcarsales.co.uk and look up under "CONTACT". WE ARE AVAILABLE 7 DAYS A WEEK, STRICTLY BY APPOINTMENT ONLY. Elegantly styled from bumper to boot, the Mercedes-Benz CLC-Class plays the role of premium hatchback exceptionally well. The interior is refined and impressively well equipped, while powerful engine options deliver a thrilling ride. 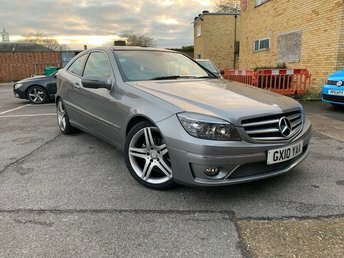 You'll find the best deals on used Mercedes-Benz CLC Class models for sale in Harrow right here at First National Car Sales UK Limited. Why not take the opportunity to view our complete range of used cars here on the website, before contacting a member of the showroom team to discuss your requirements in more detail. Rest assured that all of our used cars are thoroughly inspected before going on sale to ensure complete peace of mind.